So, the mantel has been passed, the brisket-making mantle that is. 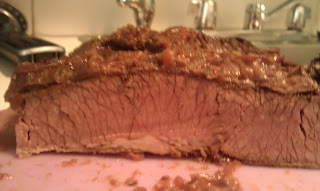 My beloved Aunt Susie, keeper of the brisket flame and arbiter of all things briskety said to me this Rosh Hashanah: “This is the best brisket you have ever made. It may be the best brisket I have ever eaten. I pass the mantel on to you.” A sweet new year indeed! The recipe is Melissa Clark’s from the New York Times with some modifications. The pot is the star here, and the meat, of course. The pot is Le Creuset which I received for my birthday last year by my dearest bestest Isabel Rose and the meat was first cut brisket from Fairway Harlem (their second cut was too small to feed 10 people). Here is the original recipe and then below is the recipe with my modifications mainly due to availability. Thyme leaves, for garnish (optional). 1. Rinse and pat dry the meat. Season brisket all over with salt. Place it in a large container and cover with garlic and half the thyme sprigs. Cover and refrigerate overnight. Let meat stand at room temperature for 30 minutes before cooking. Wipe off garlic and thyme. 2. Heat oven to 325 degrees. Place a very large Le Creuset over high heat. Add oil. 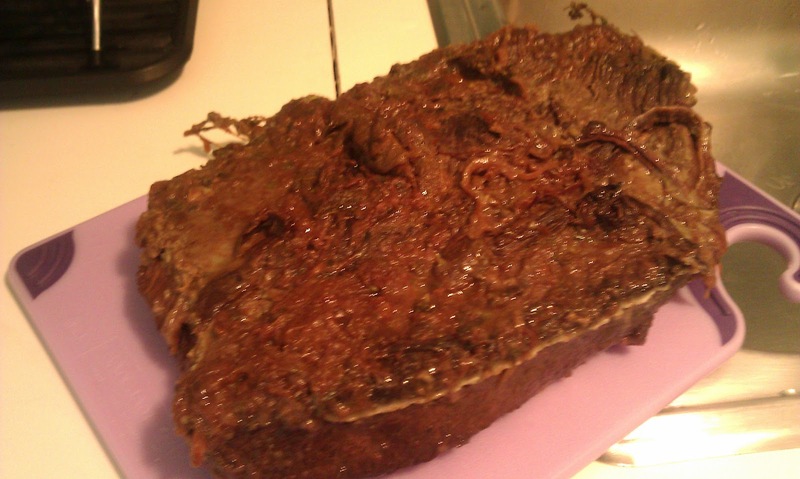 Place brisket in pot and cook, without moving, until browned. It'll take about 7 minutes per side. 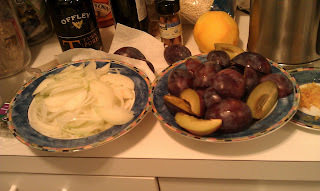 Transfer to a plate once browned. 3. 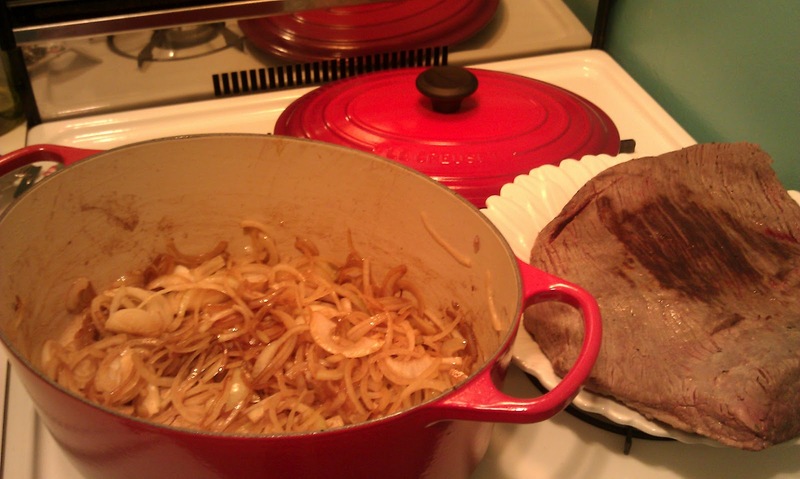 Add onions to pot and reduce heat to medium-high. Cook onions, tossing occasionally, until golden brown around the edges and very tender, 15 to 20 minutes. Pour in wine and scrape up any browned bits from the bottom of the pot. Stir in bay leaves, cinnamon, orange zest and remaining thyme. 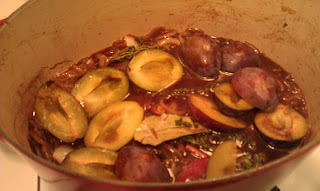 Scatter half the plums over the bottom of the pot and nestle brisket on top. Scatter remaining plums over meat. Cover pot and transfer to oven. Cook, turning every 30 minutes, until meat is completely fork tender, about 5 hours. 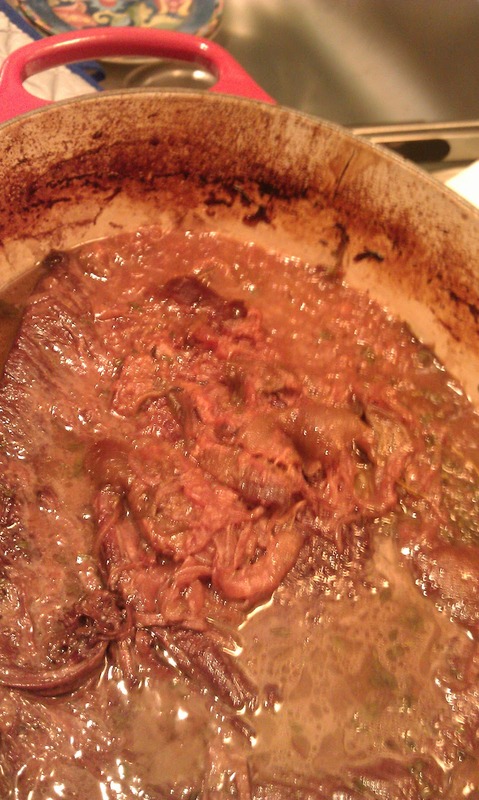 After 4 hours, uncover the pot so some of the liquid can evaporate and sauce can thicken. 4. Let brisket cool completely in the pot, then refrigerate, covered, overnight. (This makes it easier to remove the fat from the top with a slotted spoon.) Take out meat while cold and slice thinly. Transfer back into pot. Reheat meat in a 300-degree oven for about 45 minutes before serving. Garnish with thyme leaves, if you like. I have a problem with tannins, and so avoid red wine. Do you have a recommendation for a substitute? I bet stock would be delicious: chicken beef or vegetable just to give the base some body. Let me know how it goes!